Price reduced on this 60' Matthews yacht for sale in Florida! : Atlantic Yacht & Ship, Inc. The price has been reduced on this 60′ Matthews yacht for sale with Brad Nelson. In the first place, this classic yacht for sale is one of only five ever made. In addition she is the last one surviving and is in great condition. Known as “Artania II,” this 1970 60′ Cruiser was built by Matthews in Port Clinton, Ohio. Furthermore, she is the last of the wood-hulled Matthews yachts before they started building in fiberglass. In fact, the company was originally owned by a Michigan congressman. In a word, he was a regular sight cruising the Great Lakes every summer! As can be seen, this classic yacht for sale has been consistently updated and maintained. After all she won first place in the Les Cheneaux Antique Wooden Boat Show. Moreover, that was the third time she has won that honor! This classic yacht for sale enjoyed cruising up north until she relocated to South Florida waters in August, 2014. 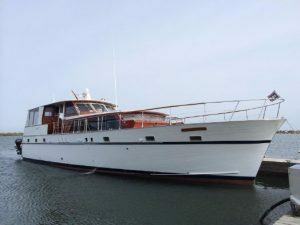 For more information on 60′ Matthews classic yacht for sale be sure to contact Brad Nelson today!